Remember making an apron in Home Ec? Remember Home Ec? If we have to explain “Home Ec” you may delete this. I just don’t have the energy anymore. Read on. The History of ‘APRONS’ I don’t think our kids know what an apron is. 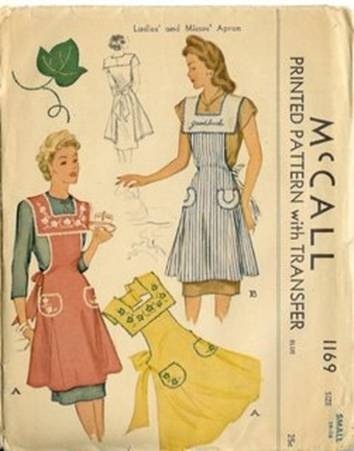 The principal use of Grandma’s apron was to protect the dress underneath because she only had a few and because it was easier to wash aprons than dresses and aprons required less material. But along with that, it served as a potholder for removing hot pans from the oven. 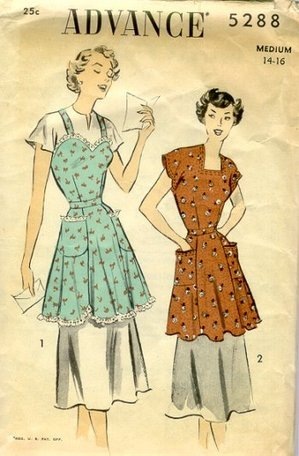 My mom and both grandmothers wore aprons like your photo. I never wore one, though having stained a lot of my clothes while cooking, I wonder why I never did. Hi Kathy. I’ve stained plenty of clothes cooking, too. I think aprons are viewed as old fashioned. Kind of crazy. I mean, why ruin good clothes when we could avoid it so easily? Maybe it’s a sign of our throw-away society. Such a fun post, Lyn! I too, remember my Nana who was a beautiful seamstress making aprons for my mom and I. I still have a couple she made with rickrack (sp?) and cute pockets. I”ve kept them for sentimental value, don’t ever think to use them! I’ve always preferred bibbed aprons and recently when I tried to find one, I had to settle for one worn for “grilling” in the backyard because apparently any kind of apron is hard to come by now. Toni, the only places I ever see aprons are the kind you mentioned, or in restaurants, and even there the servers don’t always wear an apron. Sort of sad to see such a traditional, useful garment disappear.